Join Greg Shields of Concentrated Technology and Max Kolomyeytsev of StarWind Software in this informative webinar series as they explore the new approaches in delivering SAN storage to remote and branch office situations. Part I - Getting maximum simplicity with the smallest possible hardware footprint. Remote and branch office employees are people too! But all too often these far-flung users get treated like second-class citizens. Latent networks, minimal budgets, and poorly-performing offsite storage interfere with their workplace efficiency. New approaches in SAN storage offer to solve the offsite problem with intelligently-designed on-site equipment. The new best practice in remote office SAN storage combines maximum administrative simplicity with the smallest possible hardware footprint. Register today! A technical deep-dive on hardware-less SAN technologies for remote office Situations - Part II of this exciting webinar series continues the conversation with a look at the software that drives a modern software-based SAN. With no expensive networking equipment, a couple of Windows servers, and just enough local disks, you can quickly deploy and manage SAN storage at any remote or branch office. Register today! Summer is already here, and the weather is not all that is going to be hot! We have some sizzling hot deals going on right now for a limited time! Buy any StarWind software-based hypervisor-centric virtual machine storage solution by June 30, 2014* and get BIG discounts off list price. With the countdown discounts melting down with every passing day, you can SAVE BIG if you ACT NOW! Contact Starwind and take advantage of our special offer now! * These promo discounts cannot be summarized with any other special offers and promotions. 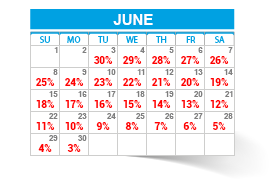 ** To receive these BIG discounts, all Purchase Orders should be sent to Starwind by June 30, 2014.